Ireland has been described as a dog-shaped island. If it isn’t clear why, try looking at a map turned so the west coast is at the bottom. Dogs feature in lots of stunning knot work designs. And historically, we’ve been an underdog. We’re a loyal, fun-loving, live-in-the-moment kind of people, with a charm that makes it hard to stay mad at us. Is it a stretch to make a canine connection? Not if you are a dog lover who also loves Ireland. If that describes you, you might want to know more about the canine Irish gifts loved around the world now. Giving animals as presents is rarely a good idea, but if you are looking for a dog, you might want to consider these Irish dog breeds. 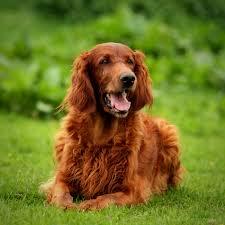 Irish Setter: These are not low maintenance dogs, but they are rewarding friends if you have the time and energy for them. They get accused of being nervous, but that is often because their huge need for exercise is not being met. Those glorious, shimmering copper red coats need a lot of brushing, but most of them will enjoy it. Just like Irish people, they have a well-earned reputation for being friendly, playful, great with children and fiercely protective of their loved ones. Did you know they are the symbol for the national bus service Bus Eireann? Irish Wolfhound: Don’t be fooled by their massive size. These gentle giants are very calm and low key, but at more than 100 lbs, they do take up a lot of space. They are leggy hounds who love a good run, but indoors they are very content to snooze on their bed… or yours. Did you know the Irish Wolfhound is the star of the tragic legend of a prince who left his dog to mind his baby while the family was out? They returned home to find blood splattered all over the nursery. The prince drew his sword and killed his beloved dog, and at the sound of the dog’s final howl, the baby’s cry was heard from beneath the blankets in the cot. When the prince lifted his baby from the cot, he saw the body of a slain wolf next to it. Kerry Blue Terrier: With the Irish gifts of being smart, alert and fun-loving, Kerry Blue Terriers are actually born black and their color changes as they mature. If you want a good guard dog who will enjoy learning some tricks, the Kerry Blue might be the one for you, especially if you have concerns about shedding or allergies. They don’t shed. Did you know the Kerry Blue Terrier is believed to have been developed in County Kerry to help the locals outsmart the property owners and poach game on their lands? The dogs you see in the knot work on various Irish gifts are usually long and lean hound-shaped creatures perhaps inspired by the Irish Wolfhound, but really doesn’t every dog deserve some Irish gifts such as his own shamrock dishes?